"... The ACA statute and regulations allow companies to include both quality improvements and medical services when calculating total MLR medical spending. Insurers may subtract (i.e., disregard) state and local taxes and some licensing fees from total MLR expenses... The ACA MLR is now the national minimum standard that must be met by covered health insurers..."
"... The MLR provisions apply to fully funded health plans, which are plans where insurance companies assume full risk for incurred medical expenses. The MLR does not extend to self-funded plans... Non-profit insurers and Medicare plans were not subject to the MLR during the first two years the ACA was in effect... The HHS granted three-year MLR waivers to select states where it determined that MLR implementation could harm the individual insurance market..."
"In general, the higher the MLR, the more value a consumer receives for each dollar of paid premium. For example, an 85% MLR means that 85% of premium dollars paid into a plan are paid out in the form of benefits. A 75% MLR means that just 75% of premium dollars are used for benefits. The MLR is an aggregate measure. Because the ratio is based on a health plan’s overall performance, some enrollees may pay more in premiums during the course of a year than they receive in benefits, while others may receive benefits that far exceed their premium payments..."
"... The ACA MLR standards require that covered insurers in the individual and small group markets meet a minimum MLR of 80%. For insurers that sell large group plans, the minimum MLR is 85%. The higher MLR requirement for the large group market accounts for economies of scale; in other words, it is more efficient to sell insurance to a large company that will offer coverage for many individuals and families than it is to have to market a product to one individual at a time, or to firms that cover a smaller group of individuals. Thus, the higher MLR standard for large companies reflects their assumed lower administrative costs..."
"... Definition of Medical Claims: Incurred claims = direct claims incurred in MLR reporting year + unpaid claim reserves associated with claims incurred + change in contract reserves + claims-related portion of reserves for contingent benefits and lawsuits + experience-rated refunds (exclude rebates based on issuers MLR)..."
"... 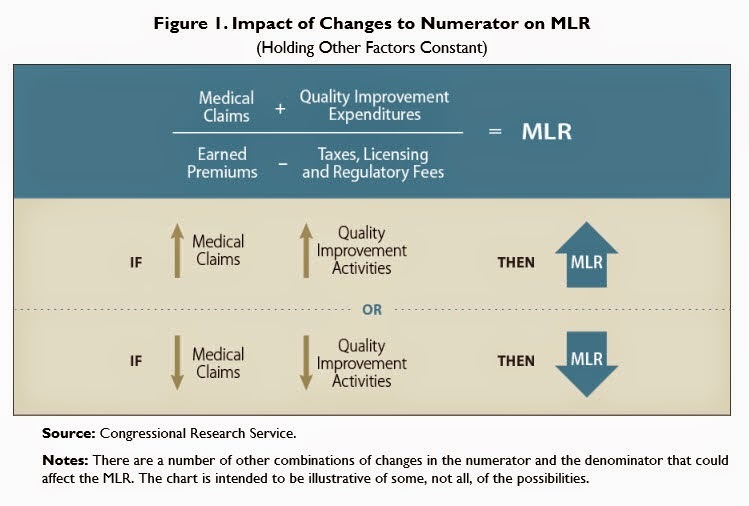 The ACA allows insurers (with some exceptions) to include spending for quality improvements in the numerator for calculating the MLR. In other words, companies can meet the federal MLR medical claims requirement, in part, by increasing activities designed to enhance the quality of their insurance products. Thus, the actual definition of what constitutes a quality expenditure is important to the MLR calculation..."
"... Final HHS rules let insurers count money recovered from fraud and abuse initiatives toward the MLR requirement for medical benefits spending, but do not allow companies to count broader fraud prevention activities..."
"... A key part of the MLR calculation is the definition of premiums, which is in the denominator of the MLR formula. 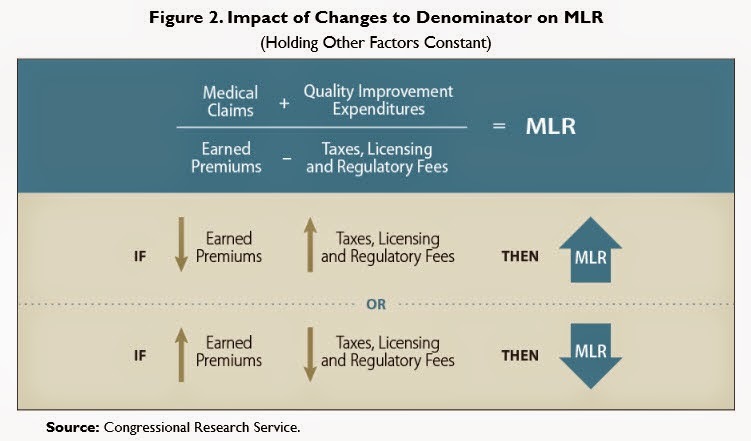 Holding medical claims and quality improvement constant, an increase in premium revenues lowers the MLR, while a reduction in premium revenues raises the MLR. The ACA also allows insurers to subtract certain taxes, licensing, and regulatory fees from premiums, which can further increase the MLR amount (and reduce the likelihood of paying rebates)..."
"... Premiums are calculated based on earned premiums, and are defined as the sum of all monies paid by a policyholder in order to receive coverage from a health insurer... Taxes, licenses, and regulatory fees are subtracted from premiums under the MLR formula. Since they reduce premium revenue, higher taxes and fees can raise the MLR... Federal taxes are defined by HHS as all federal taxes and assessments allocated to health insurance coverage that are subject to the MLR reporting requirements under ACA. Federal income taxes on investment income and capital gains are excluded from this component as they are not considered taxes on premium revenues and, thus, should not be used to adjust premium revenues..."
"... The ACA requires that the MLR calculation include methodologies to account for the special circumstances of smaller plans, different types of plans, and newer plans. To that end, the NAIC recommended, and HHS adopted, two “credibility adjustments” designed to address issues associated with random variation in claims data... The first credibility adjustment is intended to address health insurance plans with low enrollment... A second credibility adjustment is available to insurers that have a large share of high deductible health plans (HDHPs)..."
"... The ACA gave the HHS Secretary the authority to adjust the 80% MLR standard for the individual health insurance market if the Secretary determined that applying the standard could destabilize the individual market in a given state. States were allowed to request a temporary adjustment in the MLR ratio for up to three years, to avoid coverage disruptions in their individual markets... Seven states were granted an adjustment: Georgia, Iowa, Kentucky, Maine, Nevada, New Hampshire, and North Carolina. 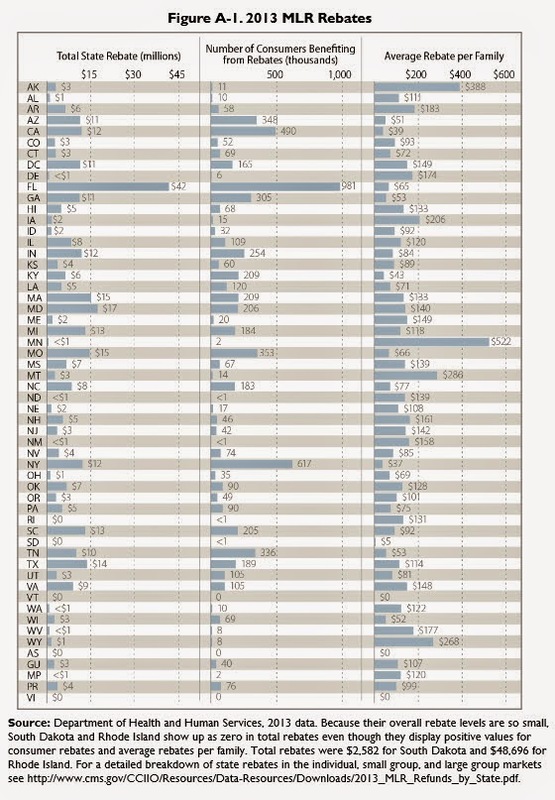 Ten states and a territory were denied an adjustment: Delaware, Florida, Guam, Indiana, Kansas, Louisiana, Michigan, North Dakota, Oklahoma, Texas, and Wisconsin..."
"... Health insurers that fail to meet the minimum MLR requirements must provide rebates to policyholders... The NAIC recommended, and HHS agreed, that the entity distributing the rebates may choose whether to disburse payments to current enrollees as a lump-sum check or a deposit to a credit or debit card..."